Knock out the competition with a winning bartender cover letter. An effective cover letter grabs the employer's attention and helps you land the job you want. Before adapting this sample cover letter, read the job posting carefully in order to include the relevant details that target your application to the specific bartender job opportunity. Make sure your cover letter clearly articulates why your skills and strengths are a good match for the position. I believe that I am well qualified for your bartender position, recently advertised on ABC website, and I am submitting my resume for your kind consideration. Expansive knowledge of spirits, wine, beer, cocktails, non-alcoholic beverages, drink preparation, presentation and pricing. Successful introduction of new products including craft beers and specialty liquor via well-attended promotions and events. Outstanding customer service skills resulting in a X% increase in regular customers during the last 6 months. Excellent track record of effectively up-selling food and beverages. Proven record of accurately and efficiently handling all cashiering duties. My outgoing personality and can-do approach to any task make me a valued team member and ensure that each customer enjoys the best bar experience possible. I would welcome the chance to meet with you to further share my skills and interest for the job. You can use these phrases to develop and build your own persuasive cover letter for the bartender job. Select skills that are relevant to the requirements of the specific job opportunity. Verifiable history of meeting and exceeding customer expectations with prompt and helpful service. 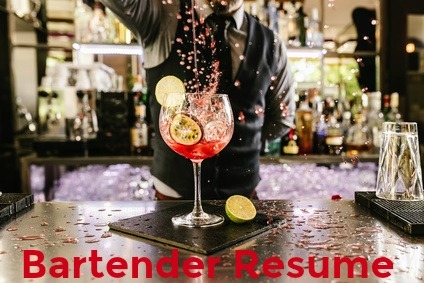 A professional bartender with the ability to maintain 5 star service in a high volume and demanding environment. Accurately maintain inventory to avoid over-stocking and depleted supplies. Demonstrated ability to make a connection with each customer resulting in increased number of "regulars". Successful in using up-selling and suggestive techniques to increase sales. Works with a sense of urgency to provide friendly and efficient service to teammates and customers. Track record of controlling customers' alcohol intake in a professional and non-confrontational manner. History of maintaining the bar, bar service areas and storerooms in a secure, tidy and organized manner. 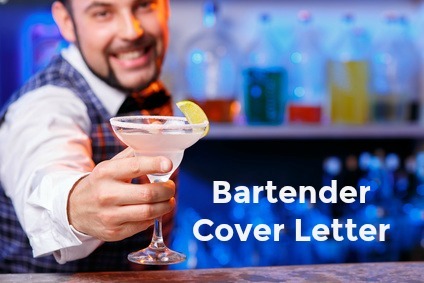 The bartender job description will further help you with developing a great cover letter. Customize this bartender resume template for your own use.